Not a lot is known about the early history of playing cards in Ireland, but during the nineteenth century playing cards were being produced in Dublin (John Young), Cork and Limerick. From the surviving specimens these were crudely drawn and the court cards often turned the wrong way for no apparent reason. 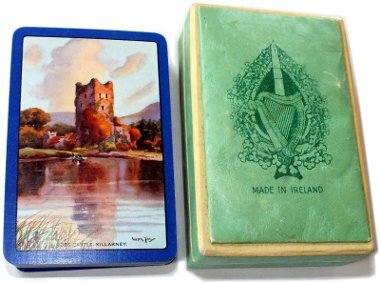 During the twentieth century the Irish Playing Card Manufacturing Company (Cork) and The Ormond Printing Co. Ltd (Dublin) were producing cards for the Irish market, and subsequently there have been advertising, tourist souvenir packs and also art and design packs manufactured in Ireland and abroad. It is enjoyable to recognise traces of Celtic decorative patterns in Irish playing card designs. Formerly the Celts inhabited central and western Europe long before the Christian era but ultimately they were confined to Ireland, Scotland, Wales, the Isle of Man and Brittany. 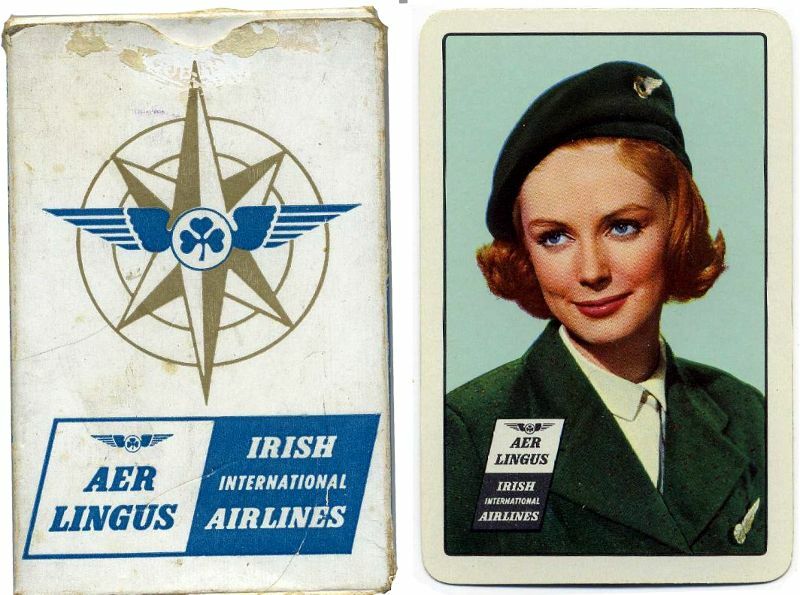 Above: a) Commemorating the establishment of the Irish Free State by treaty with England in December 1921, design by Edward Cunningham of Goodall & Son, 1922. b) Aer Lingus compliments pack. c) Joker from Irish Souvenir deck. d) Joker from Irish Heroic set, 1919. e-f) 2 cards from Irish Historic set, c.1920. The Celts loved personal splendour and self-display as well as fighting. Surviving examples of their art include shields, swords, manuscripts, metalwork, jewelry, poetry and literature. Irish playing card designers often take their inspiration from these sources. 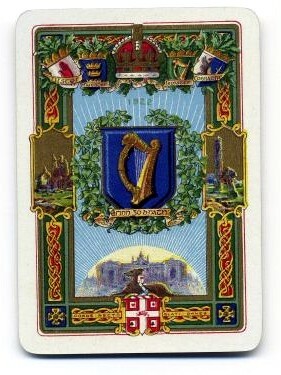 Above: Irish Historic Playing Cards, 1920. Above: Souvenir playing cards published by C. T. Co. Ltd, Dublin, c.1950s. Several editions of these cards are known, with either green or orange coloured backs. 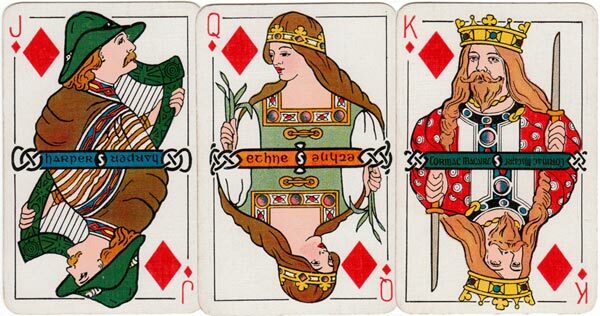 Above: “Cultúrlán” Celtic myth playing cards.